Why can I not have a purely virtualized SAN in vSphere 5? I cannot enable the iSCSI port binding option (it is greyed out and unchecked) or add the VMkernel to the iSCSI software host bus adapter unless there is a physical NIC associated with the vSwitch. You can have a purely virtualized SAN in vSphere/ESXi. I do it with NFS often. 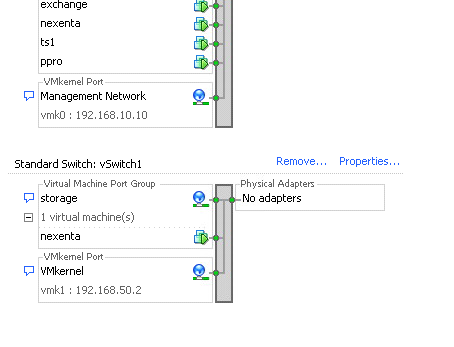 Did you create a new vSwitch for your storage network? Not the answer you're looking for? Browse other questions tagged vmware-vsphere iscsi or ask your own question.